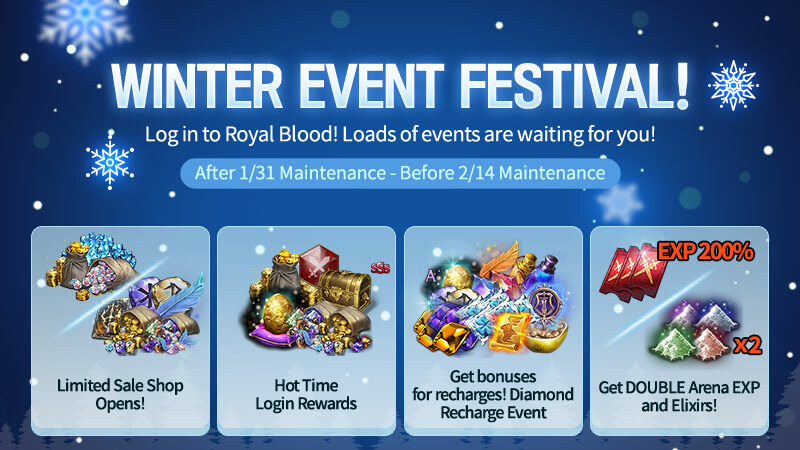 Thread: [Event] Royal Blood Winter Event Festival! Amber Town will be holding some great events! We invite all Royals to participate! [Event 1] Hot Time Login Rewards! - A login reward and a push message will be sent every day at 6 PM PDT during the event! - The login reward can be claimed before 12:59 AM PDT next day. ※ The event login rewards will be sent to your Mailbox and can be claimed once per account. ※ Rewards cannot be transferred between characters. Be sure to claim them with your main character. 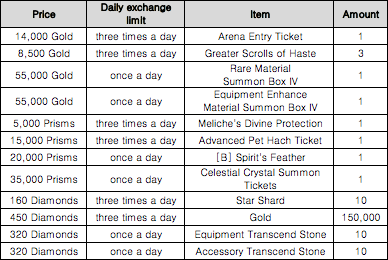 *Pet hatching cards have the same probability as the store. This item does not affect the bonus of the pet hatching cards in the store. Event rewards will be sent on the date displayed in event rewards at a specific time. Event rewards can be claimed in Mailbox upon logging in within 24 hours of the reward distribution date. - The event login rewards will be sent to your Mailbox and can be claimed once per account. - Rewards cannot be transferred between characters. Be sure to claim them with your main character. - The secret shop can be found in Menu -> Event during the event! - Secret Shop items can be purchased with Gold/Prisms/Diamonds. ※ Secret Shop items can be purchased only a certain number of times per day. - Secret Shop items can be purchased with multiple characters. - Purchased items will be sent directly to your Bag. - Event Rewards may or may not be bound, depending on the items. - The event period is subject to change. 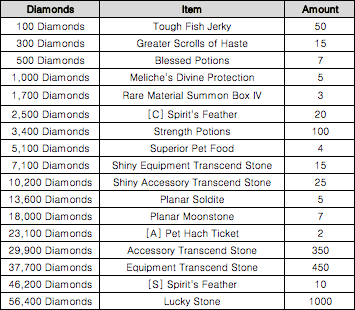 [Event 3] Diamond Recharge Bonus Event! - When you recharge your Diamonds during the event period, you will receive bonus rewards depending on the number of Diamonds you recharge. - View at Menu > Event. When you complete necessary missions, the reward button will be activated. - Diamonds can be recharged, and rewards will also be sent, separately for each character. ※ Only Paid Diamonds will be taken into consideration. - Rewards will be sent out depending on the amount of Paid Diamonds that are recharged during the event period. - Diamond Recharge Bonus Event takes into consideration only Paid Diamonds that are recharged, not Free Diamonds or bonus Diamonds. - Be sure to tap [Claim] in Menu -> Event after reaching a milestone. - Event rewards can be claimed once per account. - The event rewards will be sent to the Bag of your currently logged-in character. - Rewards cannot be claimed if there are insufficient Bag slots. - Event period and rewards may be subject to change. [Event 4] Get DOUBLE Arena EXP and Elixirs! 1) During the event period, get double Training Rank EXP from the Arena Battle. 2) During the event period, get double the Spores by collecting Battlefield Elixirs. - The Double Event Effect will only be applied during the event period. - The collecting amount will go back to regular number after the event is over.